I've been having a clear out of my studio this week. I unearthed a load of orphan blocks. Some were left over from quilts, some were practice pieces to try a new technique, some were supposed to be a quilt but I got bored! So each morning this week I came into my studio an hour early and quilted them all up and I have made them into cushions. My hexi quilt will never be finished because the cat was sick all over it whilst I was piecing it together and so half of it had to be cut off and thrown away. The few blocks that were left have been made into this cushion and a loose cover for my footstool in the lounge. Wasn't happy with the centre of the star so decided not to make it into a quilt... a cushion is fine if you don't look too closely! Katy very kindly lent me her ruler for making kaleidoscope blocks. I had it for ages, long enough to make at least 3 quilts using that block but this was all I came up with.....enough for 2 cushions! I had to give it back to her eventually or she would have thought I had kidnapped it!! Sorry Katy. This was my attempt at an 'Urban Deco' block. Love it but a quilt made using these blocks is a long way off. These were made for a mini challenge. My friend Janie sent me a jelly roll and a couple of charm packs of Minick and Simpson fabric (can't remember the range) and these are what I made. I was trying out some foundation piecing and my little 'twister' ruler. And these blocks were another go at a red and white quilt. I will make a full size quilt eventually using this pattern as I love 'house' quilts. This is a picture of them all on my sofa. They don't match anything in my house but since when has that been a factor in the quilts we make? Maybe 13 cushions is overkill......perhaps I should open a shop! At least I am sorted for birthday gifts for a while! Just in case you think I have been too self indulgent this week, I have done some work. 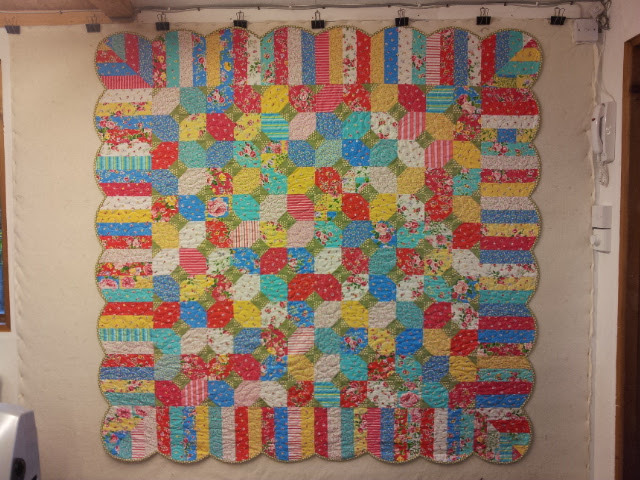 This lovely quilt made using a Material Obsessions pattern was beautifully made by Kris. She modified it slightly as she didn't want to applique the arch onto the background fabric. Instead she made a template and stitched it using curved piecing....so clever. This is one that is going on my quilting bucket list. It was quilted using a pattern called 'bubbles' using a shocking pink thread. The following quilt was made by Katy. A variation of the 'scrappy trip' quilts that we are all making at the moment. There are so many ways that the blocks can be set. Love that 'Chicopee' fabric. I still haven't cut into mine but seeing it all made up into a quilt has made me think I should get if off the shelf and into a quilt. Katy wanted a sort of loopy figure of eight pattern on it so this is what I did. I used a bright green thread called lime splash. This quilt was made by Jan using some lovely African blue and white fabrics.... so fresh. Jan also made this storm at sea quilt. I quilted it with a wave pattern, keeping with the 'sea' theme. Well that just about sums up my week. Hope you all have a good weekend. PS. Have discovered Pinterest this week!! When I have worked out how to get a button on my blog, I will put one on if you want to see how I have been wasting hours of my time!!!!! So much inspiration. Love it. I love all those cushions! And the M.O. quilt. And Katy's S.V quilt. And..! I love all your makes - the cushions look wonderful all together! Amazing Chris - so inspirational. I LOVE all of your cushions! After four or five, they don't need to match anything. The un-matchyness (?!) is a style all its own. Oh my word! You had me at the first cushion! I can just feel the texture. Gorgeous. Wow! All your cushions are stunning!! Lovely as ever. What a great way to use up orphan blocks. The MO quilt looks tempting I can see why it is on your to do list . Love all those cushions, and your quilting on those quilts. Fabulous post! I love your pillows - just discovered this site today. Would you share how your pillows look so inviting to snuggle up with - most quilted pillows look stiff but not yours. What is your secret if you don't mind my asking? I was wondering why all the pictures are gone? I wanted to see the gorgeous pillows!